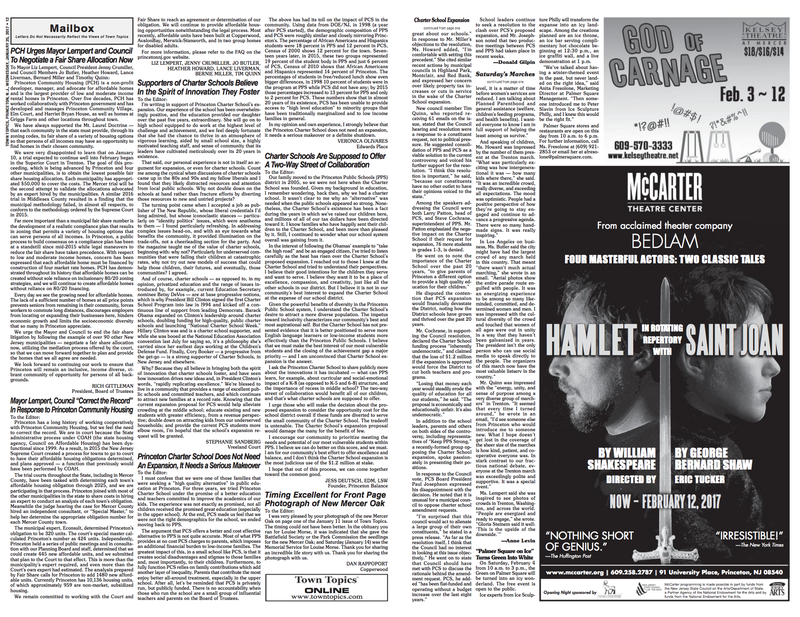 The Town of Princeton’s ongoing litigation over affordable housing took an unusual turn this week as Mayor Lempert and the members of Princeton Council issued a letter to local newspaper ‘The Town Topics’ defending their legal fight. In response to a letter from long-time affordable housing advocates that called for a settlement in the town’s court battle, the Mayor and Council members issued their own statement aiming to ‘correct the record’. The town also published a ‘Frequently Asked Questions’ document on the municipal website, aiming to update local residents about what is happening with the court case. Unfortunately, both the letter in ‘Town Topics’ and the online ‘Frequently Asked Questions’ contain out-dated information, which serves only to confuse the matter. Princeton Council has funded a number of legal efforts aiming to limit the amount of affordable housing that is built in town. One of these efforts was recently dismissed by an unanimous verdict of the New Jersey Supreme Court. The other is ongoing, in Mercer Superior Court. 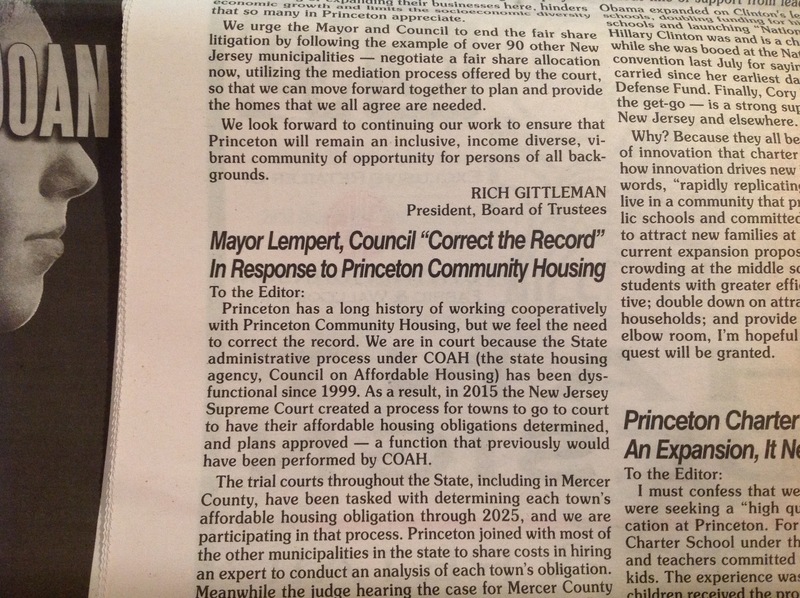 Principals at ‘Princeton Community Housing‘, a nonprofit group that has been managing affordable housing in town for decades, recently sent a letter to Council, urging them to settle this litigation. Instead of doing so, Princeton Council has responded with their own case, defending the legal action. In their letter and FAQ, Council argues that ‘Fair Share Housing Center‘, a nonprofit group who are representing the interests of low-income New Jerseyans in the current court case, is demanding an unreasonably-high amount of affordable housing in Princeton. In attempting to justify this position, Council cites figures from a court-appointed expert and ‘experts’ hired using local taxpayer funds (Philadelphia-based Econsult, who have lost several recent housing cases). According to Council, their own expert calculated that Princeton ought to build 320 new affordable homes, and the court’s expert suggested 424 homes. But both of these numbers are out-of-date. Econsult published new figures in May 2016, which said that Princeton ought to build more homes. And the court’s expert has also updated his analysis, which means that the number used by Council is no longer valid. The Mayor and Council presumably figure that most local residents are not following the case closely, and will therefore give them the benefit of the doubt. On the other hand, many residents are wondering why Council can’t end the affordable housing litigation immediately by joining the 100 New Jersey towns that have already made a settlement. At their meeting on Monday night, Council received a petition from over 200 residents, urging a settlement. In response, Council Members Jenny Crumiller and Bernie Miller said it was impossible to make a settlement, because the ‘other side’ (Fair Share Housing Center) was showing a lack of ‘good faith’. However, Fair Share Housing Center are offering to negotiate in public (see below), and it is Princeton Council that, alarmingly, appears to be using outdated statistics to support their case. Privately, local affordable housing advocates are astonished at Council’s position, and bemused at the latest letter in ‘Town Topics’. 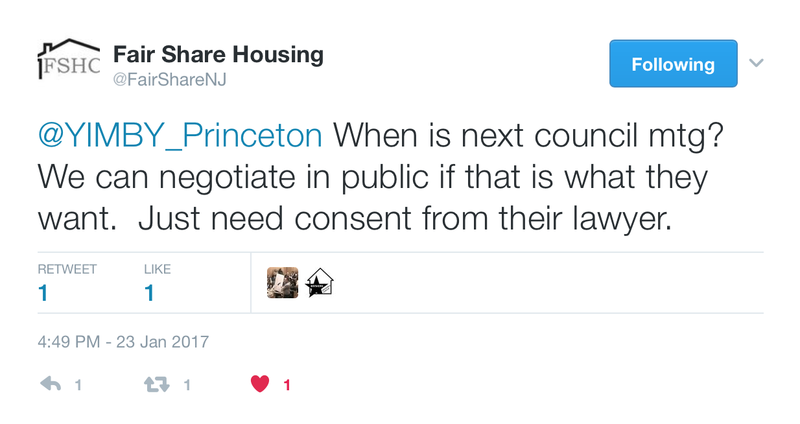 The feeling is that the all-Democratic Princeton Council could easily negotiate a settlement if it wanted to, and then work to provide affordable housing in a way that respected the character of local neighborhoods. The affordable housing case at Mercer Superior Court involving Princeton continues. No judgement is expected before February. This entry was posted in planning, Princeton. Bookmark the permalink.